Bent in the shape of an "S"
This hand-crafted, deep-muscle massage tool provides a way for people to manage chronic muscular pain both on their own and in conjunction with professional medical treatment and therapy. Ergonomic shape allows the user to apply deep and self-controlled pressure to trigger points. The Backnobber II device is designed to be hooked over or under the shoulder so that one of the two ends can be pressed into any of the muscles of the upper or lower back or neck. The Backnobber's carefully drawn, natural shape allows the user to apply as much pain releasing pressure for as long as required to achieve its remarkable effects. 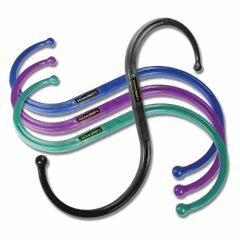 Backnobber tools are available in an assortment of colors. TheBacknobber measures approximately 19 inches in overall length with curves 9 inches across. Easy To Use. Good Value. Effective. On-the-go. Daily Use. Weekly Use. Men. Women. i have been needing something like this for years. a friend of mine has one of these that she got years ago. and when i tried hers i knew i had to have one of my own. and with a little bit of internet searching i found exactly what i wanted at a fantastic price right here at AllegroMedical. (and believe me, you won't find a better price anywehre, i looked!) there are places on my back that ache and feel kinked up and i could never reach those areas, until now. this is so easy to use. and you can use it anywhere and almost anytime; watching tv, taking a break at work, chatting on the phone, or just to knead out the kinks after a hard day at work. you don't need a 2nd person to use this item. it is 'do it yourself'. and it works wherever you have a sore spot or a tight muscle. just place it where it hurts and apply a little pressure. i haven't found a negative about this item. i am going to buy one for my stepmother. she has neck issues and pain issues. i think this will be great for her. just try it and i think you will feel the same way i do: the only thing better than the backnobber would be a personal masseuse. When I feel a sore spot on my back, the nobber hits the spot and makes it better. Easy To Use. Stops pain in it's tracks. Sturdy. Relaxing. Do it yourself. Improves Circulation. Relieve Tense Muscles. This is a lifesaver for me. I love that you can apply it to yourself. It frees me from having to depend on someone else for pain relief. It gets me up and running again. Without it I would be in pain for days, even weeks. It arrests pain in its tracks!! !If I had the money, I would by EVERYONE I know a Backnobber!! Rather than explain it myself I'll just drop a link to a youtube video where it is explained. https://youtu.be/mmiO5q6ayr0 I hope this answers your questions.